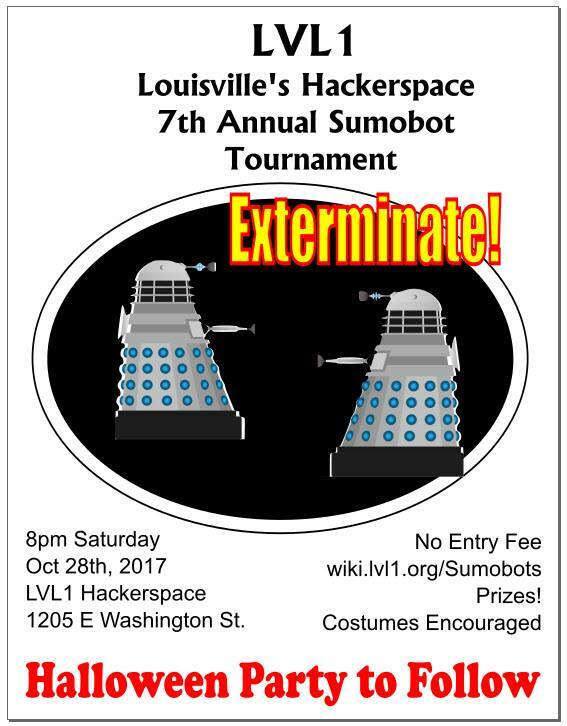 This Saturday, 28 October 2017, join us for our 7th annual Sumobot Tournament/Halloween Party. You don't have to be a member to attend this fun event. Watch autonomous robots try to push each other out of the ring. Costumes are encouraged. (And, of course, all kinds of nerdiness is encouraged -- costumewise or otherwise.) Festivities begin around 8:00 pm and last until way after the last robot is left standing. The Sumobot Tournament will probably begin around 9:00pm. The party has no end in sight. Check the calendar on our events page for other upcoming events and workshops.